This class consists of TONEI, SAINEI, HIYOSHI and FUJISHIMA MARUsy completed between Apr ’41 and Mar ‘42 for various shipping companies. TONEI MARU was requisitioned in Jul ‘42 by the IJN and registered that same month as an auxiliary collier/oiler. 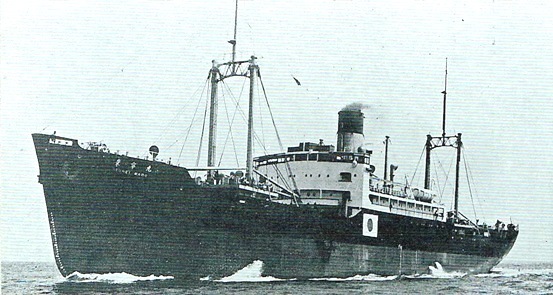 SAINEI MARU remained under civilian control. HIYOSHI MARU was requisitioned by the IJA and served as Army transport No. 802. FUJISHIMA MARU was requisitioned by the IJN as a general requisitioned transport; she was lost in Feb 42 after stranding. The three others were torpedoed and sunk between Dec ’41 and Jul ‘44 by submarines. Builder and Year Completed: Sakurajima. Osaka Iron Works K.K. shipyard. Propulsion: OOne steam turbine engine, one shaft, 2,700 shp. Speed: Cruising: unknown – Max: 16 knots.